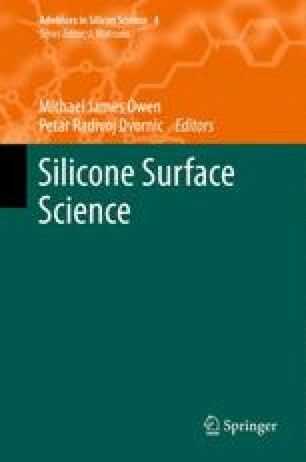 The mechanisms behind the loss and recovery of hydrophobicity of silicone rubber after exposure to oxidative surface treatments, such as UV irradiation, corona or plasma, are presented. Initially, polar groups are introduced into the surface region, mainly in the form of silanol groups. The oxidation then proceeds towards a vitrified silica-like surface layer. The formation of complex buckling patterns, formed by the mechanical stress difference between the silica-like layer and the rubbery bulk opens the way to a wide range of new applications, such as gratings and flexible electronics. The main challenge is to address the hydrophobic recovery process after an oxidative surface treatment. In some applications, such as high-voltage outdoor insulation materials, this recovery is desired but usually it is not. The most common methods of inhibiting hydrophobic recovery are extraction of the silicone rubber to remove extractable oligomers, storage of oxidized silicone rubber in water directly after treatment, or the grafting of polar species onto the oxidized surface.